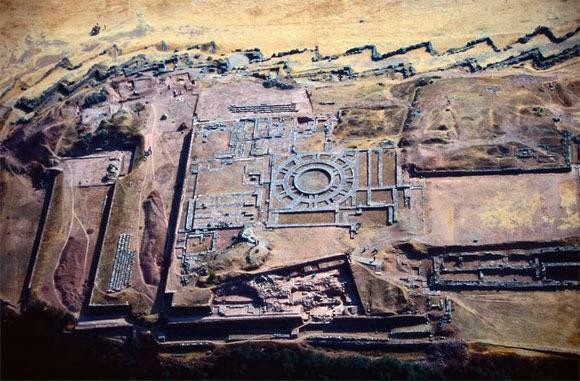 Saksaywaman is distorted form of Sakshat Waman and a temple on the northern outskirts of the city of Cusco, Peru, the historic capital of the Inca Empire. Saksay or Saqsay is a Quechua word meaning, `to be full’, and Waman is the Hawk (or person travelling on Hawk). According to Vishnu and Bhagavata Puranas, Lord Vishnu’s fifth avatar is Vamana (Waman), who was first full human avatar and he travelled all over the world on his hawk (Garuda). When Vaman took 3 parts of land from King Mahabali (Asia, Africa and Europe), he asked Bali to settle along with his people in Patala Loka (South America). 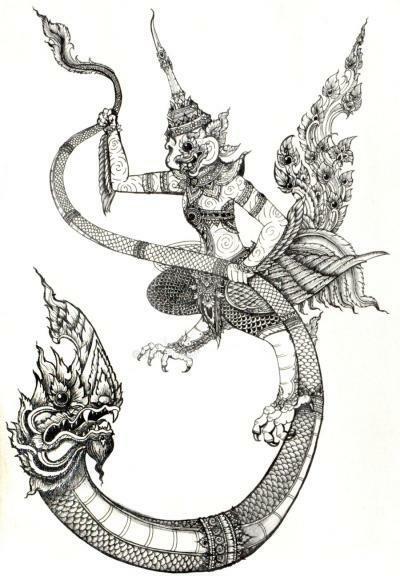 Vaman travelled on his Hawk (garuda) and destroyed all demons who lived in this region, to make it clear for Bali and his men to settle here. Machu Picchu, which is about 90km northwest from SaksayWaman in Cusco Region, Urubamba Province, Machupicchu District in Peru, was built as temple of Inca God, the creator, Viracocha. This Viracocha is none other than Vamana God. Viracocha means “one who turns the world upside down“, which perfectly matches the description of Vamana Dev. Lord Vamana took 3 paada bhoomi (3 quarters of inhabitated land) from King Bali and sent him to occupy 4th remaining part, which was on the other side of Bali’s kingdom. If the globe is turned upside down, on the other side of South India (Bali ruled from Kerala), is South America and that is Patala Loka. 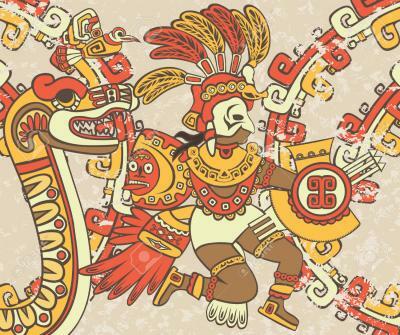 Viracocha and other deities, were nomadic and had a winged companion – the bird Inti , a kind of magic bird, knowing the present and the future, represented in oral myths as a hummingbird with gold wings (Quri Qinqi), who is none other than the Garuda, and eagle, who carries Lord Vishnu. The term SaksayWaman is itself a distorted form of Sakshat Waman, which means Vamana God himself in full glory. Even though, it was thought to be built around 900 CE and Machu Picchu around 1450 CE, Inca civilization goes back long way. Machu Picchu or Machu Pikchu in Quechua language means ‘Old Mountain‘, which indicates that this place was in use for worship of God Viracocha (Vamana) since ages. 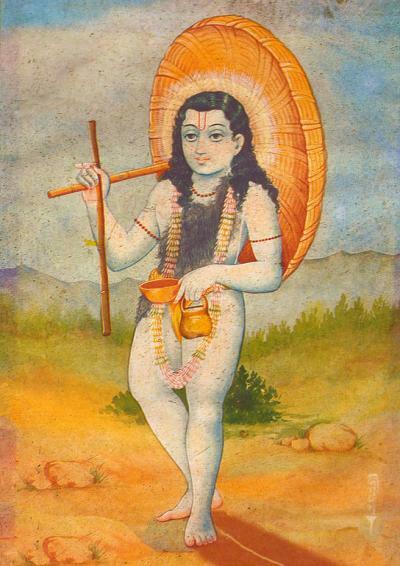 Viracocha with cane in hand, sun around the head (umbrella of Vaman), pot mendicant on the other hand, is exactly same as described for Vamana dev. After King Bali agreed to settle in Patala, Vamana gave him a boon that he will be protecting Bali’s kingdom until end of present Maha Yuga and Bali would be promoted to Indra’s position later. Translation : Earlier, Vishnu as Trivikrama (conquerer of 3 parts/worlds), took pinnacle of Saumanasa and area below it as first part (here पदम् /Paadam should be considered as a quarter as in Nakshatra Paadam or quarter, not as literal foot), second part was the pinnacle of Mt. Meru and its area and Bali offered 3rd part as his head, which means his own kingdom/land). According to Inca oral history, Tupac Inca “remembered that his father Pachacuti had called city of Cuzco the lion city. He said that the tail was where the two rivers unite which flow through it, that the body was the great square and the houses round it, and that the head was wanting.” The Inca decided the “best head would be to make a fortress on a high plateau to the north of the city. After the Battle of Cajamarca during the Spanish Conquest of the Inca, Francisco Pizarro sent Martin Bueno and two other Spaniards to transport the gold and silver from the Temple of Coricancha to Cajamarca, the base of the Spanish. 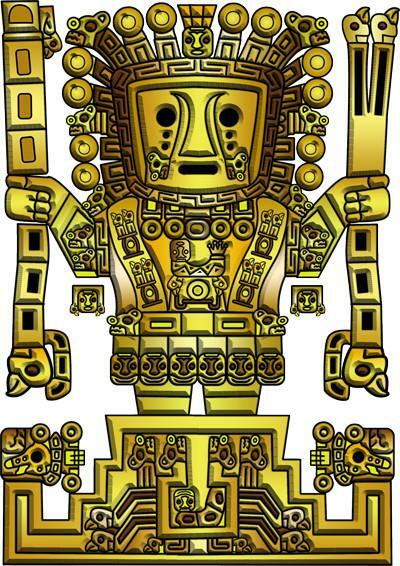 They found the Temple of the Sun “covered with plates of gold“, which the Spanish ordered removed in payment for Atahualpa’s ransom. Seven hundred plates were removed, and added to two hundred cargas of gold transported back to Cajamarca. The royal mummies, draped in robes, and seated in gold embossed chairs, were left alone. Hanan Pacha : the world above, inhabit the celestial beings, constellations, stars, rays, stars, rainbow, clouds. Kay Pacha : the world here, terrestrial beings live, the mountains, the lakes, men, animals, plants. 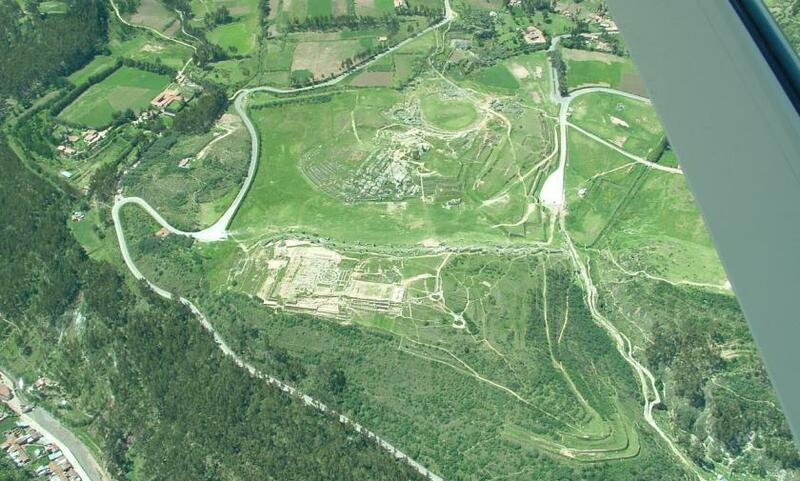 Uchu Pacha : the underworld, living the mallquis that are the seeds, the ancestors buried to the earth born young men. Just 3 of the 5 windows are remaining, 2 closed. This place is called Wiñaywayna, that mean Eternal youth or Forever Young. It has many structures that are considered as baths, where the Inca clean his body and mind, and that baths had minerals that cured any kind of pain and sickness. The way that this was built, one can avoid the magnificence and precision of the carved stone so perfect that no razor blade, not even a hair could enter between the rocks that were put one on top of another. 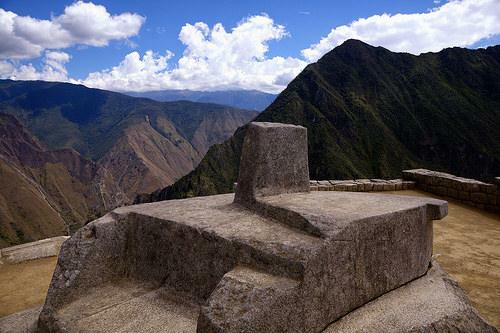 The other important site is the Inti Watana, which has a ritual stone associated with the astronomic clock or calendar of the Inca in South America. The stone is erected like a Siva Lingam, with a platform around it. In the late 16th century, the Viceroy Francisco de Toledo and the clergy destroyed those inti watana which they could find. They did so as they believed that the Incas’ religion was a blasphemy and the religious significance of the inti watana could be a political liability. The Inti Watana of Machu Picchu was found intact by Bingham in 1911, indicating that the Spanish conquerors had not found it. Inti Watana was aligned with the sun’s position during the winter solstice. 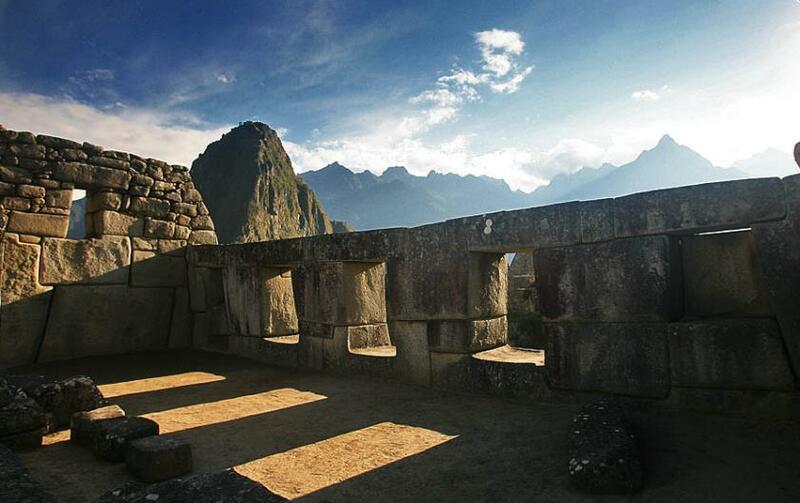 The Inca believed the stone held the sun in its place along its annual path in the sky. At midday on November 11 and January 30 the sun stands almost above the pillar, casting no shadow at all. On June 21, the stone is casting the longest shadow on its southern side and on December 21, a much shorter one on its northern side. The festival Inti Raymi, is celebrated based on Sun’s movement.